A few weeks ago I took a look at the Brewers new bullpen. Had some great feedback on that, so to continue this preview of sorts of the 2013 Brewers, I will be taking a look at the projected starting rotation. As I began writing this piece, I asked my followers who they thought would be in the starting five. This created quite the stir, as my mentions blew up through the roof. It's probably the hottest subject going into Spring Training for the Brewers, as the starting line-up is pretty set in stone barring injury and the bullpen is somewhat set minus one core spot to fill in spring. Ideally, Gallardo and Fiers are likely the two pitchers that are pretty much a lock for the rotation. After them, however, is when things get mighty interesting. Out of the four other leading candidates, only one has an option to be sent to Triple-A; which makes this very simple to decide on my projected starting five. 1. Yovani Gallardo - I don't think this is a surprise to anyone that Yo will be in our rotation in 2013, and rightfully sitting at the top. In 2011, Yo had one of his best pitching years since becoming a pro as he finished 7th for National League Cy Young. Though still posting a decent record in 2012, Gallardo became very inconsistent. It took Gallardo a good portion of the season to get into a rhythm. Gallardo finished out the 2012 season going 8-1 (July 31st - September 28th) with three no-decisions and an ERA of just under 3.00 (2.9998 to be exact). If Yo can get into a rhythm to start the year out, he could easily have his eyes set on 18, 19, or 20 wins this up coming season. And, any of this three win counts would be a career high (17 wins in 2011). 2. Mike Fiers - Barring an extremely bad spring, Fiers more than proved himself last season to be a starter in the Brewers' rotation. And, as a rookie last year, he is likely to get better this year. A fatigued arm made him slow down towards the end of last season, but in my eyes that was to be expected as a rookie. Last year, he lead the National League in lowest ERA for about three months or so. I would expect Fiers to go between 160-170 innings this year and easily having 150+ strikeouts to add to his resume. I'll go as far as to say his ERA will lower significantly. The good thing about Fiers is that even if he does can to start the year, he does have an option left to be sent down to the minors to tweak any issues that could arise. 3. Marco Estrada - Above I mentioned consistency and rhythm with Gallardo. The same goes for Estrada, if not more importantly than Gallardo. On April 21st, Estrada moved to the rotation to take over for Chris Narveson. He didn't get his first win until August 21st. Granted, he had eleven no decisions mixed in with his 0-5 start, but nevertheless the Brewers cant afford to have a stretch like that in 2013. As a full time starter this year, I would expect Estrada to pitch about 180 innings this season, with a strikeout total of about 170. In 138 innings in 2012, he accumulated 143 strikeouts. Estrada has to come off strong to start the year to have a consistent season as a full time pitcher in this very young and in-experienced rotation. 4. Chris Narveson - I don't think I am the only one who is very concerned for the bottom of the rotation. Narveson is my first worry. It has already come through the Brewers news wire that Narveson is "100% ready to go and cleared to pitch with no restrictions in Spring Training". Not to compare football to baseball or apples to oranges, but Packers' Jerel Worthy recently had a "bruised knee" and then had ACL reconstruction surgery a week later with Dr. James Andrews. Narveson is coming back from rotator cuff surgery on his throwing arm. Besides having Tommy Johns, it is the most difficult surgery to come back from as a pitcher. I would imagine regardless of what percentage of ready Narveson is, he is going to have some kind of innings limit this year. Depending on how his production and record is at the All Star break, I wouldn't be surprised if they shut him down then, and replace him with a young arm in the minors. The thing to remember is that the Brewers organization takes extra care of their pitchers. 5. Mark Rogers - Rounding out the bottom of the order will be Mark Rogers. Rogers made it to only 39 innings pitched before the Brewers shut him down with precautionary intentions. I would be surprised if Rogers went more than 100 innings this year. He too could be on the same path as Narveson where he gets shut down at the All Star break. Rogers is another healthy year away from being a regular starter in our rotation without any innings restrictions. Luckily, the Brewers have young, talented arms that will fill in nicely for our pitchers who might get shut down. I can think of three starters in the minors that will be on the outside looking in and are thirsty for their chance for a spot in the Brewers' rotation. First and foremost, the first pitcher to have dibs on a spot has to be Wily Peralta. I think for him to start in the minors to start 2013 is a fantastic idea simply because he still has a few things to work on before he embarks on full time status. Control issues and fatigue are his two main concerns. Giving him half the season in Nashville will give him enough time to work out his kinks to make him fully available for a call up at the All Star break. The second pitcher that comes to mind is Tyler Thornburg. Thornburg has a chance to be called up first out of all the pitchers in our minors because he can serve as a starter or he can fill in the bullpen if need be. Thornburg could use the time in the minors as well. He needs to develop better locations on his fastball when behind in counts, which will improve his 8 homeruns in 22 innings pitched ratio he had last year. Finally, top pitching prospect Hiram Burgos has a chance to make an appearance this season. Say Thornburg and Peralta are already up for Narveson and Rogers and someone needs to hit the DL, Burgos would likely be the guy we would call up unless we look to spot start someone in our bullpen like Tom Gorzelanny. 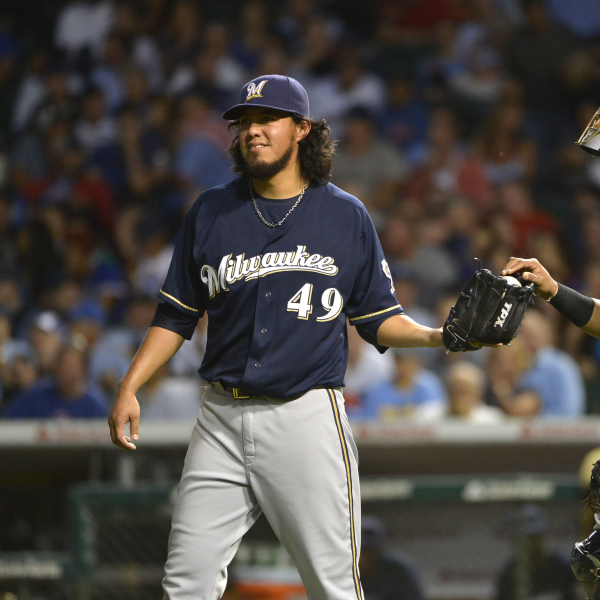 Nonetheless, regardless of how our rotation pans out, the Brewers are a few steps ahead of the game for fill ins and replacements.